In this post, BPC's archivist Anne Kumer shares some history. It also appears on NYC Circa, a history blog about New York City and its public spaces. This photo was posted on Shorpy's, a historic and vintage photo blog. It shows one of our sister parks, Herald Square, managed by the 34th Street Partnership, and the surrounding area, in 1908. That's the 6th Avenue elevated train on the right, and in front of the Herald building, the William Earl Dodge monument, now in Bryant Park. 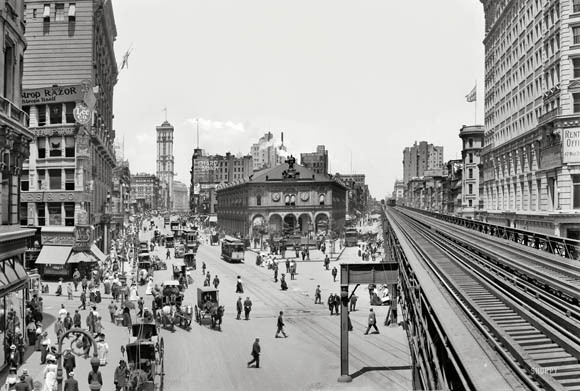 Although a relatively common view -- I'm pretty sure the photo was taken from the elevated subway station at 33rd Street, in Greeley Square -- what is special about this particular one, is the insane amount of detail and information it conveys. If you click here to see the high resolution photo, you will see much, much more. This lunch wagon, spotted by a Shorpy's commenter, and re-blogged by Midtown Lunch, was parked on Sixth Avenue, east of the elevated train tracks, or, to their left in the above photo. The commenter, Copyboy, included an exerpt from a letter sent to the New York Times complaining that the cart's placement on Sixth Avenue obstructed pedestrian and vehicular traffic from 34th Street, all the way to 42nd Street, on the northwest corner of Bryant park, where it was often seen. Displayed on top of the facade of the Herald Building, shown in a close-up below, is the James Gordon Bennett Memorial, removed from the building in 1921, and later reinstalled on a Milford pink granite pedestal in the park in 1940. The owls are another story. Not nearly as many people in the street then, as now, but it looks so much more chaotic. I can identify at least six different types of transportation in use: automobiles, trolley cars, horse-drawn carriages, walking, the elevated train (not in this close-up, but in the main shot), and that strange thing in the pink box that looks like a motorized pedi-cab with the driver in the back, and passengers up front. I guess bicycles were still too new to be considered a viable form of transporation, rather than a leisure activity. Also, without traffic lanes, and organized direction, the street looks more like a free-for-all than it likely was. They're probably all heading for the lunch wagons. These are really beautiful shots of Herald Square in NYC. It's amazing to see how much things have changed! Agreed! When was Herald Towers built? 1909 Herald Towers was built.It was the old McAlpin hotel.